In looks, the Amarok has the solid and rugged appearance of a city-friendly SUV. Smart paintwork choices are offset by sparkling chrome accents, and at higher trims you can choose sturdy 19-inch alloy wheels. There’s even a built-in step at the rear bumper to help you access and load the cargo bay. Powered by one of the manufacturer’s stunning 2.0-litre diesel power systems, the Amarok can effortlessly tow as much as three tonnes of braked weight. It can run with a manual or automatic gearbox if you’d prefer, and no version of the model takes more than 14 seconds to reach motorway speeds. Whether you’re on a longer journey or making some quick city deliveries, a wide range of technologies and systems is included as standard to protect you. Volkswagen is well known for advanced safety, and the Amarok comes with plenty of surrounding airbags and driver support systems. A 30cm ground clearance and half-metre wading limit keep you safe from rocks, rougher ground and larger bodies of water in the road. Make the most of a new Volkswagen Amarok by selecting the pick-up from your nearest Donnelly Group Volkswagen Commercial Centre in Dungannon, Enniskillen or Eglinton. 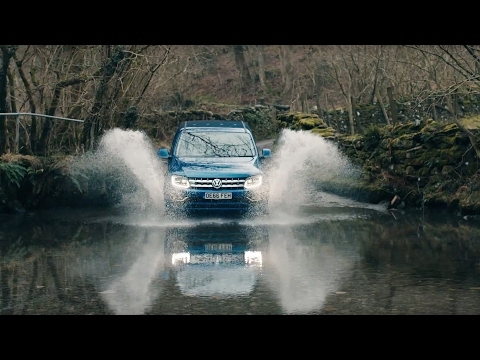 We took the new Volkswagen Amarok to the Lake District and challenged two teams with a series of missions designed to put it (and them) to the ultimate test, to prove who is a true Amarok Trailblazer. 100% pickup. 100% premium. Uncompromising off road. Spirited on the asphalt. The new Amarok combines everything that you expect from a premium and exclusive all rounder.